After reading nightly in this very cool new Swedish book about wool embroidery called Yllebroderi (a must-own-book!) 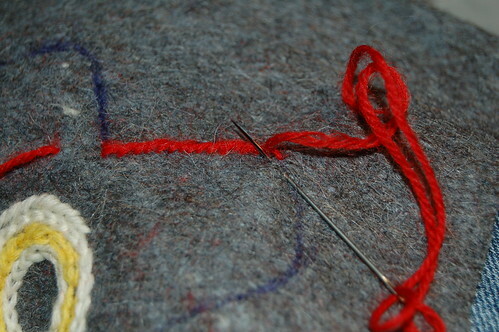 I was very eager to start a wool embroidery of my own. A bit too eager (plus watching a movie at the same time). I tried drawing a flower and filling the contours of it, but because I used a bleak white pencil the lines got diffused and the whole flower too small and very wobbly. …ripping my work and starting over! I just cut it all away and it was very satisfying to do that. 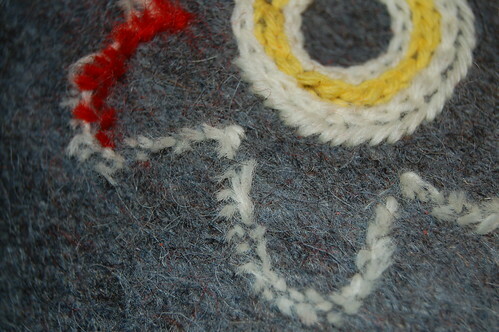 I kept the middle circle even though I now realize that the stitch I used Chain Stitch (kedjestygn) was not used much in traditional wool embroidery. I am inspired by one of the flowers in the book Yllebroderier (page 23), and it does not have any chain stitching, but since it is one of few stitches that I really master I’m keeping ’em! Jude do you draw the pattern with a ballpoint pen? I did that recently when giving up with the chalk you’re supposed to draw patterns with. depends, i use pencil or a fabric pen, either micron or pitt. usually when i cover it up quickly i use a very sharp pencil and that’s just fine. and it doesn’t run and washes out. Drawing on wool fabric (kläde) is really difficult, but the ballpoint pen worked for this time, I had already started my embroidery when I read her answer. Now I am following the lines practicing the Stem Stitch (stjälkstygn), a stitch I have used a lot, though before I used to sew longer stitches with quite a bit of overlapping. Now, in yummy wool, I am trying to get thicker lines going for the “rope look”, hehe. I’ll keep you posted on the update! 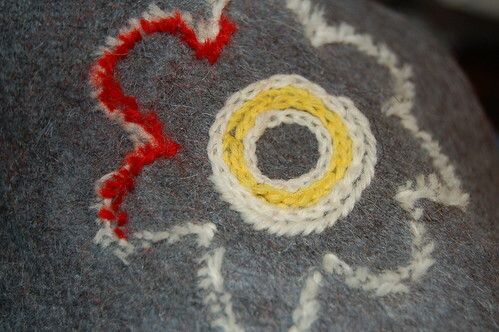 This entry was posted in Crafts and tagged beginnings, first try, link love, wool embroidery. Bookmark the permalink. So nice Hanna… Today I bought some christmas fabric in Ikea. You gave me the inspiration to embroider on it with bright colors. I’ll show you one day how to transform a pattern to a wooly fabric! Anne Berit, thanks for the recommendation. I’ve read that book many times, I love it! I have even made a pillow inspired by her work (pink birds), I should take photos of that and blog about those too some day. And the new book Yllebroderier, by Hemsl?jden, is beautiful if you’re into embroidery!